Holidays! By the end of April, things are pretty quiet in the dive shop, so I took a holiday starting April 29th, allowing about 10 days with the family before the kids went back to school after the "summer" break (Thai schools have summertime sensibly from March - May which is the hottest time of year). 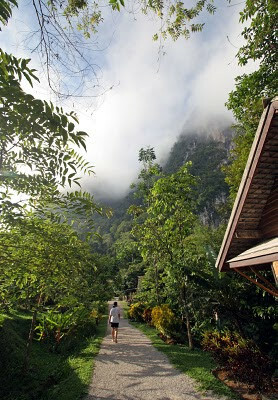 We decided to stop in the Khao Sok area for a night on the way to Chumphon. 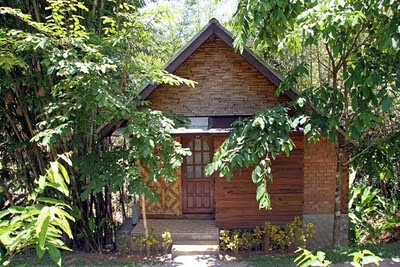 The chosen accommodation was the Cliff and River Jungle Resort, which had been recommended by friends. Looked great on the website, but don't they always?... For me, a personal recommendation is far more important. The drive from Phuket took around 2½ hours via Khao Lak. I half thought of stopping in Khao Lak to look at the boats that had been carried inland by the tsunami. Saw the famous police boat from the main road. But really, I don't want to be a "tsunami tourist". Have written about my tsunami thoughts several times on this blog, most recently in December 2008. Just North of Khao Lak, there is the small town of Takua Pa. We somehow managed a wrong turn and found out that near Takua Pa is a beautiful looking old town called Sri Takua Pa. Like old Phuket, but with no cars. I want to go back and look around some day. From Takua Pa to the Cliff and River is only around one hours drive, although we stopped a couple of times for the views. It's all hills and valleys around here and very rural. 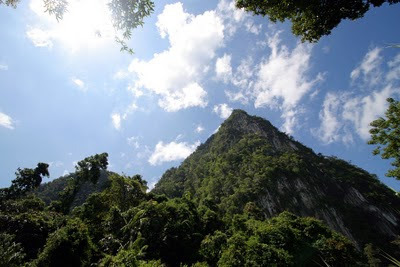 The main entrance to the Khao Sok National Park is on the North side of the road, and the entrance to the Cliff and River is on the South side around 10km after the park entrance. Before saying anything else, I'll say this - we'll be back. Location, WoW! Well, check some of the photos below. Nice people... and having been there once, we know exactly what room numbers we want next time :) No, not going to mention that here. We checked in after midday, and were given a "River" room with an extra bed. The room was quite a walk from reception. I could park the car near the restaurant, also by the river, but still a bit of a hike to carry bags. The room was decent, maybe a bit "jungly", a balcony outside by a small stream. Aircon, fridge. There was a TV, not sure why, could only get a few Thai channels. We did not use it. And a great outdoor shower for that true jungle experience. Used it quite a few times - this is a HOT time of year here! The restaurant is great, by the river, in the jungle, I liked the wooden furniture, food was good (not super cheap, mind you), beer was cold :) We had lunch there after checking in. The curry my wife ordered (Gaeng Phet Gai) was superb. Pool has a view of the huge cliff that towers 1000+ feet over the resort, has a jacuzzi, a shaded sala and chairs to hang your towel at 7am to beat the Germans :) The kids loved it right away. 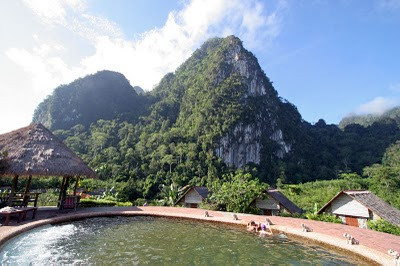 Now, Khao Sok has all kind of activities like rafting, canoeing, hiking, elephant trekking.. maybe next time we'll do a canoe trip on the river. This little trip was all about getting a feel for the place. We stayed in the pool for a couple of hours. We did get out of the hotel for a couple of hours, drove back to the main national park entrance in the late afternoon. Lots of small hotels there and jungle huts and small restaurants where we ate, as the kids said they were starving. I think the threat of a jungle walk made them hungry! From the entrance there are hiking trails of 5km or more. You can pitch a tent in this area too, we saw some people doing that. There are some bathrooms provided by the national park. 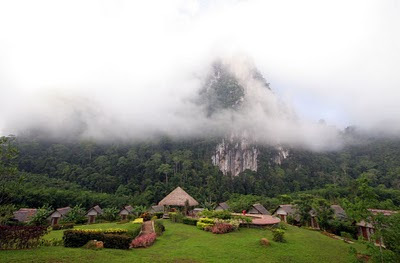 We did not see much, as really, if you want to see Khao Sok, you need to hike or do a boat trip. 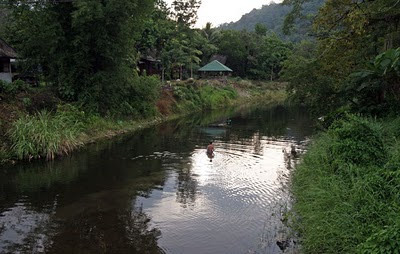 Here's a new post from 2012 - we stayed at Cliff and River again, but also did canoeing, a boat trip on the lake and tubing - Khao Sok National Park 2012. 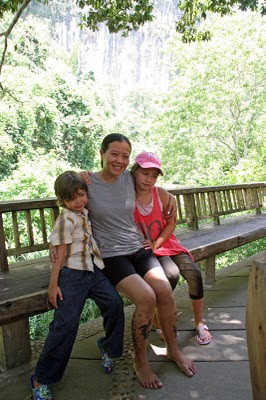 On the way back to Cliff and River we checked out another place to stay called Khao Sok Treehouse Resort. Very jungly! We climbed steps and crossed walkways to a room in the trees. The room was amazing, a huge double bed, a tent for the kids, wireless internet, aircon, satellite TV, a wonderful treetop bathroom.. they offered us the room for 2500 Baht. The website has prices up to over 5000 Baht. 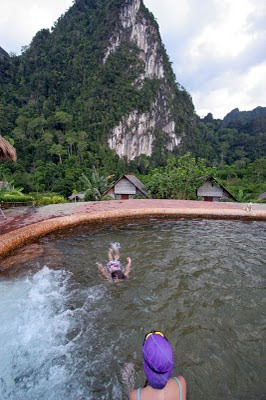 We did think about staying a night on the way home, certainly a unique place - had a pool too on the jungle floor. The night at Cliff and River was very peaceful, insect noises, we slept very well. I had to catch a fair size "tookay" lizard in our room, as my wife said it might bite us. I planned to wake early - we'd been told the place looked great with the early morning mists over the mountains. I did wake before the rest of the family and went on a wander around the hotel grounds. 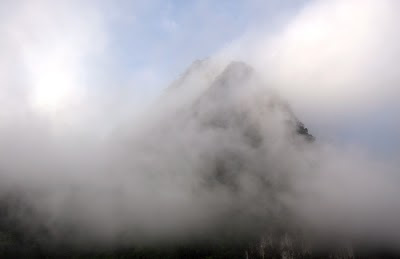 The mists covered the cliffs, the only people awake at 7am were some staff cleaning the pool. We just about managed to beat the Germans to the pool. Figured we would as we beat them to breakfast by about 15 minutes. We planned to check out before midday, but I certainly planned to enjoy the pool for a couple of hours! Views in the morning around 9am, great - blue skies and a great view of the cliff that gives the hotel (part of) it's name. Could stay there all day with a break for lunch! Hiking? You are welcome to it! We came for the scenery :) A drive around this area gives endless views. I am sure hikes would too, but our kids really don't want to go trekking and I don't plan to be "Outdoor Dad" - hey kids, let's do a 10 mile mountain hike! We do plan another trip on the lake/reservoir sometime and for sure will be back at Cliff and River, probably in September when we have some more school holidays and my parents are visiting from the UK. We paid 2,000 Baht for the night for the family (2 adults, 2 kids)... there are actually some family rooms that are a bit bigger too. A big lunch including a few beers was 750 Baht. We'd plan to stay 2 nights next time to allow more time for maybe a canoe trip or elephant ride or just more time in the pool! This place was a welcome rest. 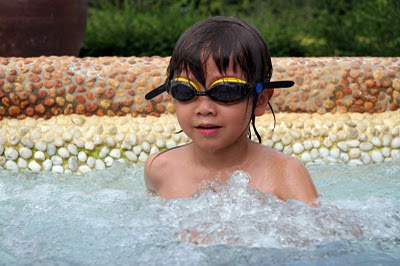 Easy to do as a weekend trip from Phuket too - we might even do that before September. 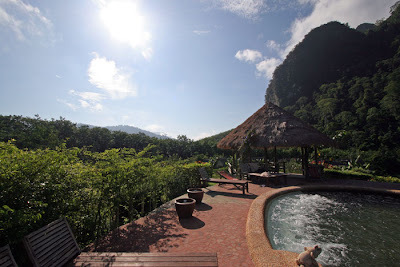 Cliff and River website is here, or there is easy to use online booking at Agoda.com. We visited again in September - stayed 2 nights, enjoyed a very relaxing time even with the heavy rain most of the afternoon on the 2nd day, I mean, it's rainforest, so you have to expect rain! The jungle looks great on a rainy day! Some friends came along too, and we had a little party. The photo below taken in the morning, my daughter went to visit a friend's daughter at their bungalow. I look at the photo and can feel the peace. 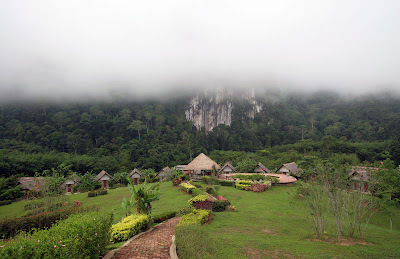 Some more photos from our September visit to the Cliff and River Jungle Resort on Flickr. Update July 2012 - we did another Khao Sok trip including canoeing and tubing on the river - see Khao Sok National Park Trip 2012.